Universal gives clients more do-it-yourself flexibility, launches uvGO online | Universal Weather and Aviation, Inc.
(April 11, 2016) — Shanghai (April 11, 2016) – Universal Weather and Aviation, Inc. has launched uvGO online, a new way to access uvGO, which allows operators to easily plan, build, and manage successful missions worldwide. 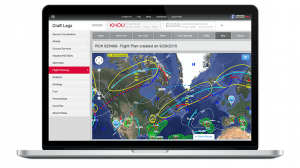 uvGO online delivers the same logical operational workflow as the uvGO iPad app, which was launched at NBAA2016. “Now whether a client is using the uvGO iPad app in the aircraft, or the online version in their office, they’ll have access to the same accurate data, simple, easy-to-use interface, and an identical user experience,” said Denio Alvarado, Senior Vice President, Global Product Strategy, Universal. Whether using uvGO online or the iPad app, users can plan their missions from beginning to end on their own, while also having the ability to optionally coordinate trips through their dedicated Universal® trip support team. With the recently announced partnership between Universal and Satcom Direct, uvGO users also have access to unlimited datalink for any business aircraft regardless of avionics. The datalink service provided by Satcom Direct is 100 percent integrated with uvGO. It allows users to track the status of their fleet, view aircraft message history, build and file flight plans, and uplink flight plans to the aircraft—without having to use separate apps or websites. uvGO is available for operators working with Universal® Trip Support Services and/or carrying the UVair® Fueling Card. Universal Clients can start using the uvGO iPad app by downloading it on the App Store and uvGO online via the login page on the Universal website. Operators attending ABACE2016 can receive a demonstration of uvGO, as well as learn more about future plans for the new system, by visiting Universal ABACE2016 exhibit #H317.